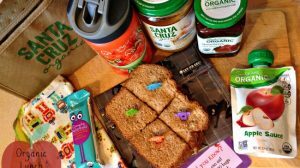 Lunchbox Love Notes for Kids Giveaway ~ 2 Winners! My mom was always good at leaving notes around for us to find. On the counter, in our bedroom, and surprises in our lunchbox. After I got married, I continued the tradition with Hubby and we would leave each other cards in misc. places around the house. Now my boys have caught on and love coming home from school to tell me what they found in their lunchbox that day. I don’t do it all the time, so it is definitely a surprise when they find something! I have to admit though, since we’ve found Lunchbox Love, they are disappointed when there is not one in their box. Not only are they disappointed, but their friends are too. It has become a daily routine for my boys to read their cards out loud for their classmates. Lunchbox Love notes are the cutest. Each card has a fun fact on the back and an encouraging message on the front. I can just see all the kids at school discussing these new lessons. They are the perfect credit card size and come in a handy dandy case. I lightly mark my boys initials on one side when I’ve used it so that I can use it again for my other children. 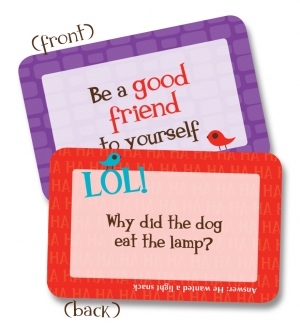 This year’s lunch time is going to be extra FuN as a new Joke version has been put out! If your kids are like mine – jokes are the best! 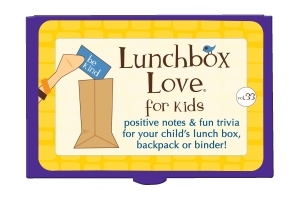 Lunchbox Love can be found online or on Amazon! WIN 4 volumes to get you started! I received this product for review. All opinions are my own. This giveaway will end on Aug 31, 2012 at midnight EST. Winners will be drawn via rafflecopter. Once a winner is drawn I will contact them and they will have 48 hours to reply before I draw a new winner. Giveaway is open to anyone in the US/Can and you must be 18 years of age or older. Giveaway not affiliated with Facebook & I release them of liability. Winner will be posted in the rafflecopter widget. Let’s Celebrate! Starbucks & Amazon Giveaway ~ 2 Winners! I do put notes in, esp. on test days, or days when they seemed grumpy in the morning! I always add something special, from flowers to organic chocolate!! i love hiding little notes to my honey and kidlets. these are so cute! no I never had..but what a neat idea!! I love these notes because they mix loving comments with jokes and trivia. I think RC is due to pick me. Don't you. I haven't yet but it's a great idea! I usually don't, but would love to start for something fun and special. I love to send notes to my daughter in her lunch at school. Now that she reads well I would love to try jokes too! My wife does that part but always signs for me - she also sends notes in my lunch every few weeks - it's nice to see inthere when I'm struggling through a long day. I started putting notes in my child's lunchbox every a.m., but feel so bad when I forget or run out of time to make one... These would make the process so much easier! Yes, I write a note on a napkin and put it in their lunch! My daughter put notes in her babies lunch boxes everyday. They love them. I do once in a while; i should actually do it more often; they usually get a kick out of it! I love to put notes in my daughter's lunch! Thank you! My grandson loves to have notes in his lunch box. Sometimes I do, but mostly just saying ‘I love you!” or "Have a good day!”. I love putting notes in my girls lunches. Thanks for the giveaway! I always put notes in my kids lunch! I do surprise my kids with notes, but not as often as I'd like. My son is just starting kindergarten this year and I think this would be such a great idea! I pack lunch for Mark a lot and often slip notes in there. These would be a fun thing to put in his lunch bag! Would like these for my preschooler, he can read but I'll have to read these to him and kind of reuse them so that. He learned what they say. These are cute. I will, once he can read! We did last year, but he couldn't read. Now that he can read we should start it up again. I think these Lunchbox notes are a great idea for children. My son is about to start Kindergarten next week and I am looking forward to putting fun notes in his lunchbox!!! I have put a few notes in their lunches before and I leave reminders on their cork boards in their bedrooms. Yes, and they surprise me back!